Far over in the eastern part of Indonesia are a group of islands where the native villagers weave a specific type of textile, called Ikat. Traveling by charter yacht is one of the best ways to visit these islands to see these fascinating Ikat Textiles, the we to tell a story and these woven textiles are really considered to the villagers to be the “Fabric of Life”. Ikat textiles and the story they tell are an important part of village life and village ceremonies. And of course, the villagers are always looking for a little extra income and are happy to sell non ceremonial Ikat textiles to those interested in bringing home a story within the “Fabric of Life”. A yacht charter from the island of Flores can include the weaving islands of Eastern Flores and the islands of East Timor, Savu and Sumba. 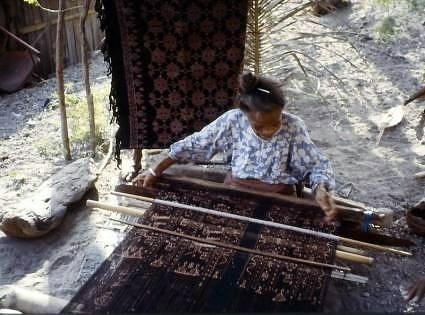 Ikat weaving is a method of weaving to create stylized images on fabrics in order to tell a specific story. 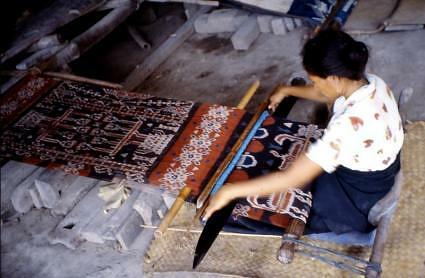 The word Ikat is derived from the ancient Malay word “mengikat” meaning “to tie”. To create an Ikat Textile, the designs are literally dyed into areas left free that are not tied, to avoid the dye. 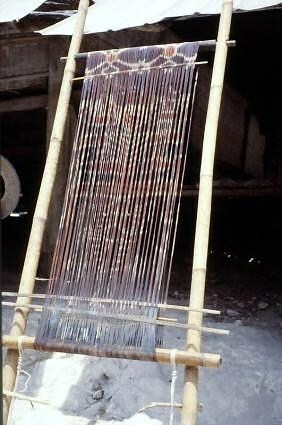 In this lengthy process, the threads that are woven longitudinally, the warp, or the threads woven across laterally, the weft, are tied on the loom and those threads are dyed into patterns, by tying off the area not to be dyed and covering with a dye resistant natural fiber like raffia. Somewhat similar to the process of Batiking, to block color in Ikat weaving, dye resistant natural fibers are used rather than wax, and the process is done before weaving, and then repeated for each dye color. Once all dyes are used and the pattern is in place, the fabric is woven with the corresponding warp or weft, depending on which threads were initially dyed. In the most intricate patterns, called Double Ikat, both the warp and weft threads are tied off and dyed and then woven together. The method of Ikat weaving is handed down through the women in the villages from generation to generation and these textiles, and the story they tell, have a very important role in various village ceremonies. If, on your charter, you are also treated to a village ceremony in the Ikat Textile weaving area of Indonesia, the village ceremony participants will be dressed in their finest and most important Ikat woven fabrics. Sacred Textiles are thought to have protective powers. Stylized birds, animals, the Tree of Life and human figures are often found in the Ikat Textile for whatever important story is being told, and by the end of the weaving process, each Ikat Textile has a specific name relating to the story within the threads. Learning about this fascinating part of the culture of the Ikat Textile weaving villages in Indonesia is a great addition to any charter in this area.